Chronic Travel Bug: Tennessee – Do I Look Sick? After a longer than anticipated stop in Arkansas, we arrived in Nashville very late at night. We were really way too tired to do anything, but we wanted to get dinner and hear a little live music if we could find anywhere open. Even though it was raining, I still really wanted to see Nashville’s “Broadway” honky tonk street, so we set out hoping a bar somewhere was open. Imagine our surprise when we arrived downtown to streets packed with people, gridlock traffic, and live music blasting from every lit-up bar. Why was Nashville pumping at 1:00 AM on a Thursday night? And oh God, why are so many of these women in leotards? Because we managed to arrive right as a Miley Cyrus concert was letting out. We’re not big drinkers or partiers and we were both exhausted from the 9 hour drive. But we were here, and who knows if we’d ever be back? So we braved the rain and the dark and the crazies and tried to find Nashville. We went into a few bars. They were all packed with very very drunk people, blasting music, and no food. Hubs was very grumpy now. Of the two of us, he’s more in to drinking and being out late, but I had decided that I was going to try to enjoy it as something I don’t do often. Hubby was just too tired and too hungry. We had one drink in the last bar we tried, Hubs taking in some of that famous Tennessee whiskey, then we dragged ourselves back to the hotel after stopping in a McDonalds drive-thru. I was tired beyond being hungry and had to force myself to eat some hashbrowns. When it was finally time for bed I was asleep before I hit the pillow. I almost forgot to mention – we stayed at the Opryland Best Western and they were total jerks. I’m really glad we were barely at the hotel because I was SO pissed off at them. We ended up needing to change our dates – not even cancel, just change! – and we did it in plenty of time before the cutoff date. But apparently no one wrote it down, and they charged us for that night that we weren’t even there. After talking to almost everyone who works there, the manager begrudgingly agreed to credit it to the night we really would be there. But he was completely rude about it, and that coupled with the fact that it was THEIR mistake in the first place made it enough for me to NEVER stay at a Best Western again. Anyway. Nashville nightlife proved to be a bit much for us. The next day we got up bright and early to go see the Grand Ole Opry before getting on the road again. It was pretty cool, but we didn’t have time to tour or anything. Not that we had the energy for that, either. But it was nice to walk around and take it all in. Driving around it was nice, too. There’s a HUGE Gaylord resort there. Fun fact: Hubs proposed to me in the Texas Gaylord. This one looked like it could fit three of the Texas one in it, and that’s no small feat. It was unbelievably huge and every inch of it was beautiful. I know I’m going on and on about this hotel that we didn’t even stay at but DANG. If we ever come back, I want to stay there. 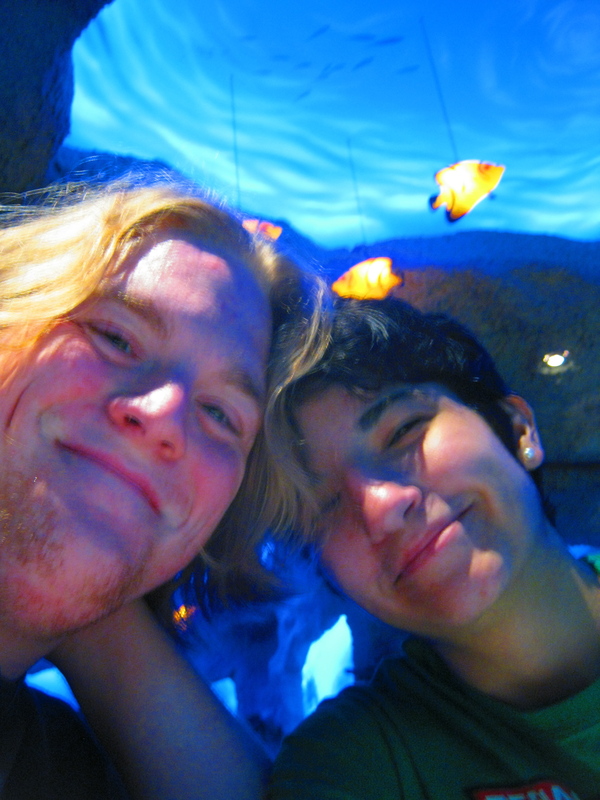 Next door was a huge mall, and near where we parked was a huge stone facade that said “AQUARIUM: An Undersea Dining Experience.” It looked like it like a Rainforest Cafe, one of our favorite chains. We’d also been to one called T-Rex, which was dinosaurs. We decided screw it. We’re going. So far we’d tried to do all these Nashvilley things that just weren’t “us,” and yeah this is stupid but it’s much more our speed. It was still really early, though. Poor planning strikes again! So we walked around the mall. They had a Disney store! That was exciting! Unfortunately, no vinyls. So we watched a preview of that new Rebels show – it looks pretty good. Haha we really failed at tourism, I’m sorry. I’m sure Nashville has much more awesome things than the Disney Store but we did it wrong. After that we got massages in those big massage chairs that you put a dollar into. It was much better than I expected, and after being in the car so long I’m reeeeeally glad we did it. Definitely a good way to take care of your muscles and bloodflow on a long trip. Plus, it’s like a $2 massage, that’s a good deal. Finally it was time to eat. 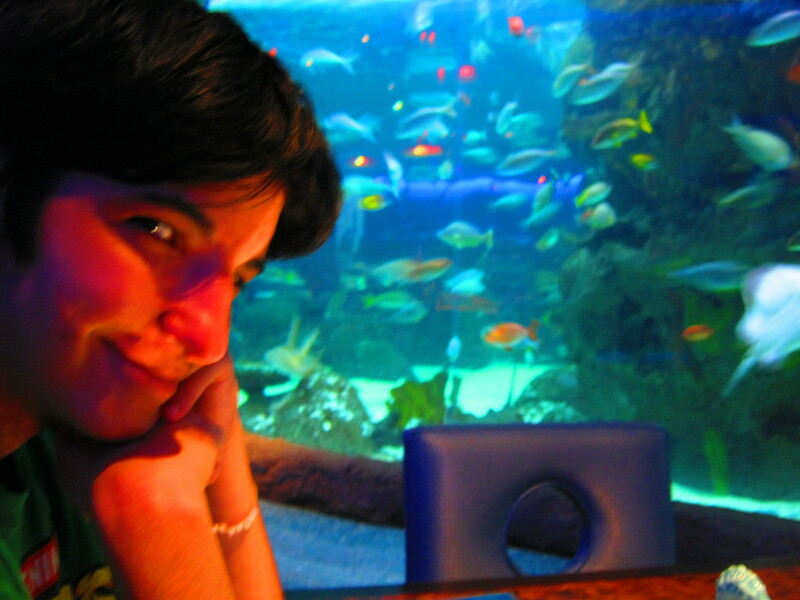 I LOVED watching this giant fish tank while we enjoyed a pretty good meal. 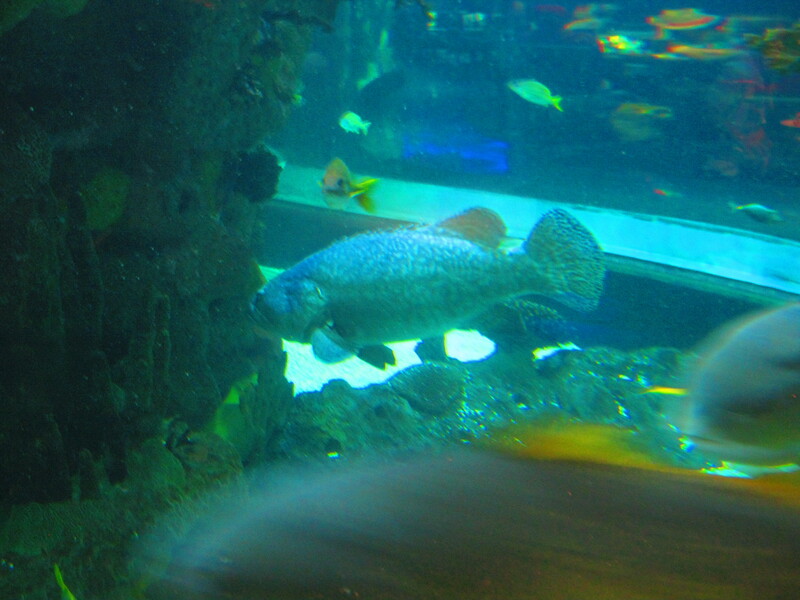 That fish on the top is a Unicorn fish – in the Rainforest Cafe in Dallas, they only have one and it’s a bit of a game to see if you can spot it. 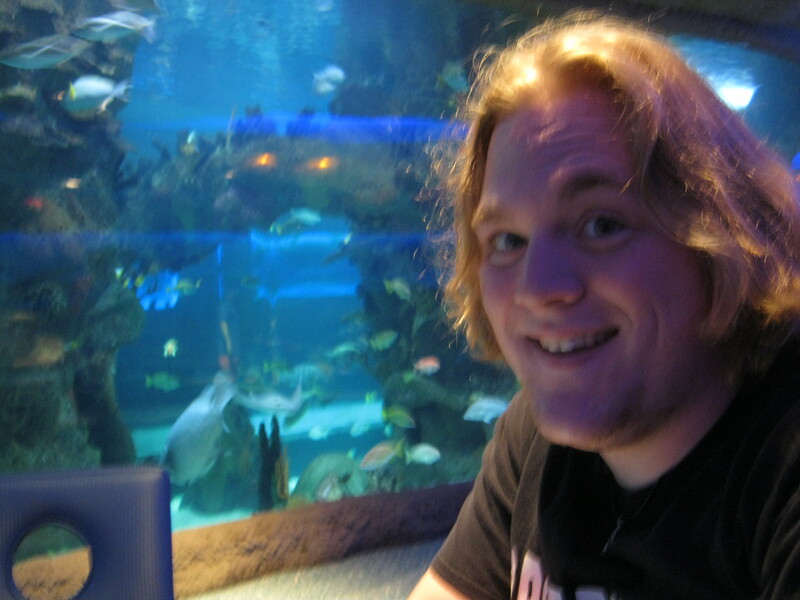 After snapping that pic I realized there was like, a million Unicorn fish in this one. In the middle photo on the bottom row is a deceptively gigantic fish. It looks small in photos but in real life it’s about my size. Our waiter said she’s a baby and will eventually grow to be the size of a VW Bug. WOW! 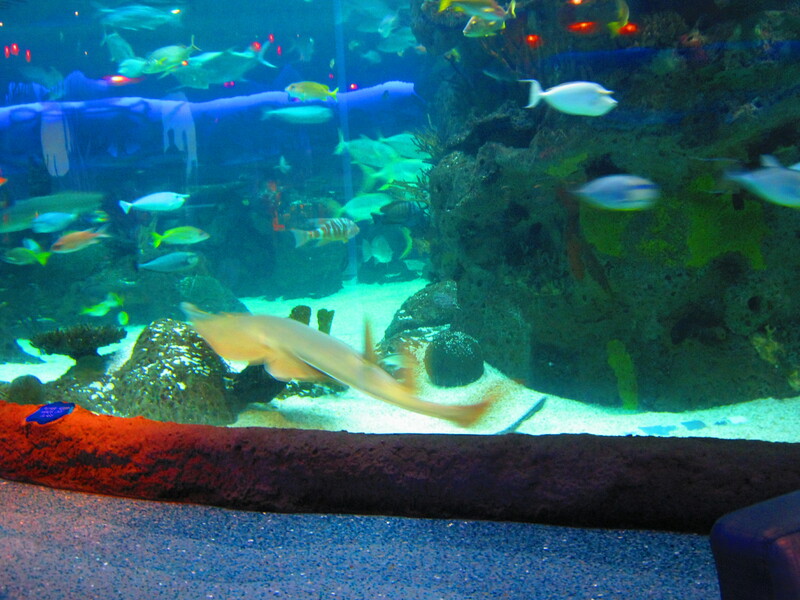 The sting rays were the biggest I’ve seen as well. That big guy is named Gibson. He’s a guitar fish. And he’s also huge. The only thing we really didn’t like about the restaurant was the service. Our waiter was a really nice guy, but he took like 5 days to do anything. We were one of the first people there and the place was almost empty, there was absolutely no reason for the service to be that slow. Even brining us the check took forever. I used to work in a restaurant and I feel for waiters, I do, but there was no excuse for this. If I was in no hurry, though, I probably would go back. The food at places like this can be hit or miss but I really enjoyed it. It was seafood, which I guess makes sense but still felt a little wrong. For a place that’s landlocked, I was surprised at how good the shrimp were. Hubs does not do seafood but they had some good options for him, too. He really enjoyed his chicken dish. So we had fun. Like I said, we did Nashville wrong, but we still had a nice time. This was some of the best scenery we found on this trip. I was hoping this trip would be like the song “America” by Simon and Garfunkle, but we didn’t actually see a whole lot on the road. Mostly forest, which was cool for the first hour maybe but got old quick. And the highway hypnosis was awful – it felt like we weren’t getting anywhere. But Tennessee has mountains, and they’re beautiful. This was a very brief and very unexpected stop, but I’m SO glad we checked it out. Hubs kept singing that song “Chattanooga Choo Choo” as we passed the road signs for it, so when we saw a sign that actually said “Chattanooga Choo Choo” with an arrow, I insisted we check it out. It turns out it’s a very old hotel. It’s stunning. I mean it. It looks like Disney World, like the Main Street area. That clean white old-timey southern charm was everywhere! What a gem. I wish we could have explored it more. That’s the largest unsupported arch in the world (click on the photos to enlarge them), which my architecture-loving hubby enjoyed. They also had real Choo-Choos where you can actually stay in lieu of a hotel room. IT’S THE BATHROOM. There’s a regular looking bathroom door that says “Ladies Room” and you walk in to this. WHAT EVEN? If any of you cool Crohn’s people do some kind of toilet tour of the US, this is a must. Memphis was my very favorite Tennessee stop. I was really excited to see Graceland, and I don’t feel ashamed admitting that it’s mostly because of Lilo and Stitch. But as a kid, that movie really made me love Elvis’s music. After wrestling with the Nashville Best Western, we were pretty much done with chain hotels and thought it’d be worth a little extra to stay somewhere smaller and nicer. We were surprised to find that the Heartbreak Hotel was actually a very affordable option! Oh my goodness. It was insane, and not just a little bit scary. I felt like any moment, one of these blue haired old ladies was going to ask me for some kind of secret handshake. But despite feeling a little out of the loop, this was probably one of the coolest ways to experience Graceland and the Heartbreak Hotel. When we arrived we made a beeline for the pool. We got to enjoy a glass or two of wine out there, which I’m pretty sure chain hotels don’t offer. I also sported a swim suit for the first time since surgery – scars and all. We had the pool almost to ourselves – one little old lady joined us briefly, and later two Frenchmen – wait, Frenchmen? Yeah, Elvis Week, IT’S A BIG DEAL. Anyway, after a good swim we went up to our room. Apparently all the rooms there have two beds, but it was still not that much more expensive than a single bed at a chain hotel. We fell asleep watching really old Elvis movies on the all-Elvis channel. I really can’t recommend this hotel enough. It’s just a really fun place and it’s really affordable. I love me a good theme. Technology has come to Graceland, which was kinda cool and kinda distracting. The whole tour is done via iPads, and narrated by that guy from full house. At first I really liked it because it was cool to mess around with it while you’re waiting in line, and I think it’s cool that it tracks where you are to automatically play narration and musical cues. My main problem with it, though, was that it really isolates you to your headphone world, and that makes it hard to share the experience with the people around you. Maybe I’m just old-fashioned. I also didn’t get why there was a 360 degree view of each room – like, I’m IN the room! I want to look with my eyes, not my iPad. But I digress. One really cool side-effect, though, is that if you take your headphones off, you can hear the tours playing for everyone around you – and again, it was a rainbow of languages. People from all over the world were there – the only place I’ve seen anything close to this is Disney World. Of course, when a person passes away, they tend to be glorified and made a saint, and yeah, if you want to know the whole Elvis story you won’t find it here. I’m not all that informed on his life outside of what I learned here, so I’m sure I’ll make him sound like a Saint too. What I do know is that he’s a really talented guy who did a lot of good things, a lot of cool things, and who is clearly still making an impact all over the world today. He’s worth talking about, and his crib is definitely worth seeing. That bottom photo is his parent’s room. I think it’s really sweet that he used his fortune to provide a comfortable life for them. You don’t hear about too many big stars inviting their parents to move in with them. His mom actually designed that divine poodle wallpaper. Another cool tidbit – the upstairs of the house is closed to the public. Elvis’s room was his personal sanctuary, and whenever he came down those stairs he was “on.” Upstairs was his hideaway from the public eye, and is kept closed today out of respect. In a world with so little privacy, I found that very cool. The house kinda gets crazier as you go, haha. That shag carpet’s amazing, you can see the hand prints just kinda stay set in there. I love his TV room – he had three TVs so that he could watch all three channels at the same time. He was like a very early Veight (Ozymandias) – apparently he got the idea from the President but Watchmen came to mind first. I wonder if he had a plan to take over the world? …Actually, considering how many languages I was listening to as I thought this, maybe he DID take over the world. The grounds are quite nice, and apparently Elvis enjoyed riding his horses and fleet of go-karts all around it. Now, this tour is a lot of standing and walking, and there’s no place to sit down inside the actual mansion. But outside in the gardens and grounds there’s lots of shady benches to take a time out on if you need it. The reflection garden was a place where Elvis would meditate and enjoy quiet time. It has since been turned into his final resting place, alongside his parents, grandmother, and a small memorial to his stillborn twin brother. I didn’t take pictures of the walk out – it was lined with signs from fan clubs all over the world sent over for Elvis Week. Once again, his lasting impact has me in awe. The museum is very cool. Of course outside there was a bunch of reporters – did I mention Elvis Week is A BIG DEAL? Those books are screenplays. As a screenwriter I loved seeing that – so much respect, these bound, beautiful scripts. There was a time when a script meant something! He’s got a striking wardrobe – I especially love that collar embroidered with red unicorns. And that paisley suit? His wedding suit. The award thing is very cool too, click on that to read more about it. A wall full of cashed checks.My favorites – incurable illness, visually handicapped, and even a clean air initiative for you MCS warriors. And check it out – hearing loops! This is the first time I’ve noticed one in real life! After Graceland we decided to have lunch at the Hard Rock Cafe on the famous Beale Street. I wanted to go somewhere a little more unique, but Hubs had never been to one so I figured this was a good one to start at. I am SO GLAD we went. It’s rare, really rare, to find service as good as the service we got there. Every single person we encountered – our waiter, the hostess, the chef, even the gift shop girl – was so kind and so attentive that I think they’d pass as Disney employees, and that is high praise. I ordered the twisted Mac & Cheese because hello I love mac & cheese but I really should have read what it actually is. It was SO spicy. I hated to be that person who sent it back but Hubs insisted, and the waiter went above and beyond. He asked exactly what I didn’t and did like, then talked to the chef and they made a special dish just for me. The chef even came out to make sure it was right. It was amazing! In the gift shop, the girl chatted with us and was excited that we were from Texas. She said she can honestly say she’s never met anyone from Texas she didn’t love. We got Hubs a shirt and after hearing it was his first Hard Rock threw in some shot glasses for free, saying “Welcome to Hard Rock!” That’s just too sweet and so cool! At both Graceland and Hard Rock I snapped pics of anything I could find having to do with Elvis’s stint in the US Army. The non-Elvis guy is my Grandfather – before I left he told me that he served at Ft. Hood just before Elvis came, and he always tells people they brought Elvis in to replace him. I’d never heard that story before! Talk to your grandparents, they have cool stories. Also, this was on display at Hard Rock too. They belonged to Elvis. And I said “Ah, a fellow chucker, ay?” AND ALL REJOICED THAT I WORKED A NINJA TURTLE JOKE IN. There’s a lot of cool stuff to see and do on Beale Street and again, we didn’t remotely have time to see it all. Next door to Hard Rock is a clothier that worked for Elvis and it was a hoity toity place. Beautiful clothes. They had blue suede Toms. I drooled over those, it was very hard not to buy them. We also popped in to see the world famous Peabody Hotel marching ducks. Unfortunately the Graceland tour took a bit longer than we planned, so we missed the actual marching show. But they’re always in the lobby hanging out if you want to visit. Be warned, though, this is like the fanciest place I’ve ever hung out. I felt severely under-dressed. So, there you have it. We did Nashville and Chattanooga on the way to Georgia and stopped in Memphis on the way back. I’m glad I gave it two passes because Tennessee is bursting at the seams with things to see. It’s not the first place that would spring to mind when I think of destinations I have to visit, but it is well worth checking out. I met a lot of nice people and made a lot of lifelong memories, and I could definitely see myself going back. Well….maybe not to Nashville. I think I’m done with that one. But everywhere else gets an A+. One more fun fact: While we were in Georgia, between our two stops in Tennessee, my Aunt and Uncle were there. We only saw on facebook that we’d barely missed each other. Small world! Pingback: Chronic Travel Bug: Georgia (but mostly how to meet an internet friend & visit kids) | Do I Look Sick?